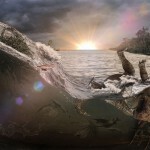 A new excavation site in North Dakota shows evidence from the day a giant meteor struck Earth, marking the beginning of the end for the dinosaurs and 75 percent of animal life. 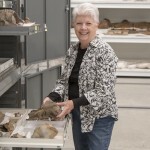 A new species of whale discovered in 33-million-year-old Oregon rock has been named for Elizabeth Nesbitt, a curator at the Burke Museum and faculty member in the UW’s Department of Earth and Space Sciences. 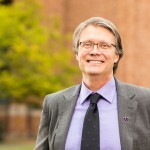 Provost Mark Richards answers questions surrounding the topic of his welcome lecture, Tuesday afternoon in the HUB Lyceum. 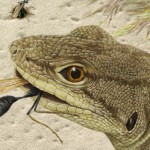 Paleontologists picking through a bounty of fossils from Montana have discovered something unexpected — a new species of lizard from the late dinosaur era, whose closest relatives roamed in faraway Asia. 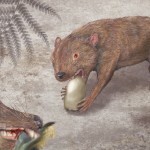 A new study by paleontologists at the Burke Museum of Natural History & Culture and the University of Washington describes an early marsupial relative called Didelphodon vorax that lived alongside dinosaurs and had, pound-for-pound, the strongest bite force of any mammal ever recorded. 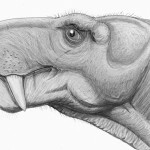 University of Washington paleontologists have discovered a benign tumor made up of miniature, tooth-like structures embedded in the jaw of an extinct ‘mammal-like’ gorgonopsian. 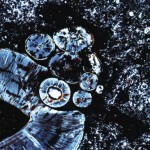 Known as a compound odontoma, this type of tumor is common to mammals today. 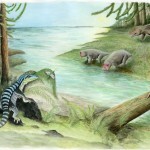 But this animal lived 255 million years ago, before mammals even existed. 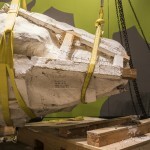 Paleontologists with the Burke Museum of Natural History and Culture and the UW have discovered a Tyrannosaurus rex, including a very complete skull. 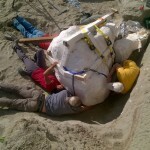 The find, which paleontologists estimate to be about 20 percent of the animal, includes vertebrae, ribs, hips and lower jaw bones. 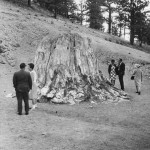 Book Q and A: To allow buildings on 34 million year-old fossils would be like using the Dead Sea Scrolls to wrap fish in, proclaimed the lawyer defending land that would eventually become Florissant Fossil Beds National Monument. 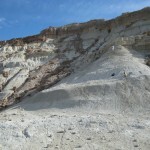 New work in Argentina where scientists had previously thought Earth’s first grasslands emerged 38 million years ago, shows the area at the time covered with tropical forests rich with palms, bamboos and gingers. 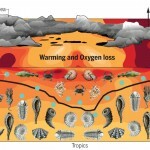 Grit and volcanic ash in those forests could have caused the evolution of teeth in horse-like animals that scientists mistakenly thought were adaptations in response to emerging grasslands. 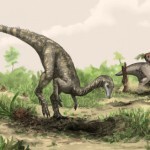 Researchers have discovered what may be the earliest dinosaur, a creature the size of a Labrador retriever, but with a five foot-long tail, that walked the Earth about 10 million years before more familiar dinosaurs.